Wherever you need a gate, bollard, barrier or lighting Green Gate can help. If we don't have it, we will build it. Our award winning SOSEC range are solar powered barriers and lighting that are being used around the UK on construction sites, homes, schools, events and festivals. They keep your site secure even when power supply is impossible. And they work all year round even in Britain! So, rest assured, we are taking your security and safety seriously. Our clients include schools, public buildings, retail centres and private homes. The UK's first mobile solar barrier/gate system. SOSEC is a revolutionary, award winning approach to securing work sites. Combining SOlar power and SECurity in a simple, rugged, visible and mobile platform. It is ideal for use within the UK's construction, highways, mining, retail, event and emergency markets. Find out how SOSEC can save your site money and carbon today. Developed by Green Gate, to provide public safety and temporary site security where power provision is not practical, but security demands are high. As staffing and security costs rise, SOSEC offers a security solution with no running costs. Saving money and the environment. A SOSEC barrier offers significant cost savings over a manned security. A rugged, galvanised steel platform with a compact footprint, SOSEC can easily be positioned and is instantly ready to provide site security. Solar power and power storage are unique elements of the SOSEC system. Designed to operate up to 900 times per day - even in an average British winter. For short-term sites and ultimate flexibility, SOSEC can be delivered with a battery store for up to one-month's use. 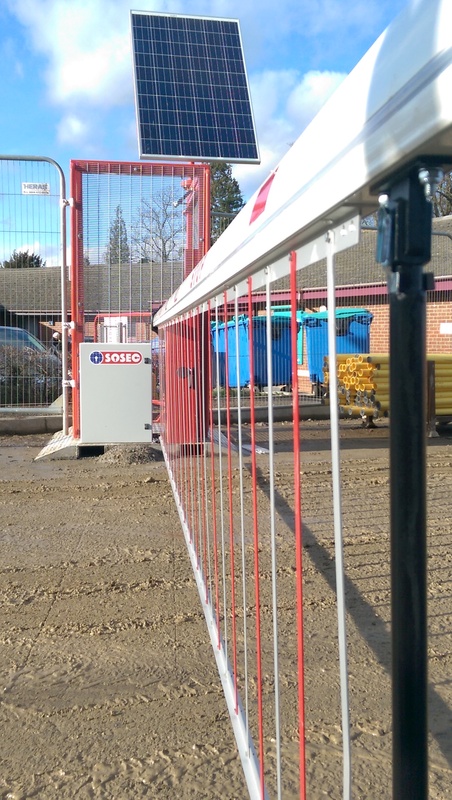 Choose our combined barrier and gate, solo barrier or solo gate, to suit your site. Access options include GSM Intercom, key code, swipe card, dial to open, fingerprint, CCTV, 3G hotspot, online tracking, timer. Each unit arrives fully tested to BS EN13241-1, force tested to BS EN 12445 and complies with the gate safety standards as defined in DHF TS011.